Worthing Symphony Orchestra is thrilled to welcome “the player of the moment” Sheku Kanneh-Mason when it performs at the Assembly Hall, Worthing on Sunday, March 4 at 2.45pm. Spokeswoman Jennie Osborne said: “Worthing Symphony Orchestra’s conductor John Gibbons has developed a reputation for his inspired and imaginative programming and his encouragement of young musicians just starting out on their professional careers. “Guest soloist for WSO’s March concert is 18-year-old cellist Sheku Kanneh-Mason - another young musician in the ascendancy. Since winning BBC Young Musician of the Year in 2016, Sheku made his Proms debut in 2017 at the Albert Hall with the Chinese Orchestra. In February 2017, he performed an arrangement of Leonard Cohen’s Hallelujah for cello and string trio at the BAFTAS, an interpretation which brought the celebrity filled audience to their feet and which has subsequently been shared and viewed by millions on social media. “Sheku’s family – the Kanneh-Masons – are seven brothers and sisters who play a broad range of classical music. They have won many prizes and awards and have appeared in numerous television shows, including the semi-final of Britain’s Got Talent, leading Simon Cowell to name them the most talented family in the world. “The Kanneh-Masons were also the subject of a BBC 4 documentary Young, Gifted and Classical: The Making of a Maestro. “In late January 2018, Sheku released his debut album Inspiration on Decca, creating an enormous buzz on social media, numerous television and radio appearances and receiving rave reviews from the critics. 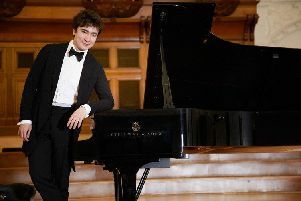 The album went straight to number one on the classical music chart and broke into the official albums chart top 20 – a rare achievement for a young classical musician. “Sheku has been dubbed the player of the moment in the media, a description that could not be more apt. From his blistering live performance of Shostakovich’s 1st Cello Concerto to a smoochy version of Saint-Saëns’ The Swan, he showcases his ability to both interpret and reinvent. His incredible rendition of Bob Marley’s No Woman No Cry, also featured on the album, has become a YouTube sensation, that crosses boundaries in an extraordinary way and resonates with a whole new audience.